Today, March 15th, a global movement led by entirely by school kids is underway to bring attention to climate change. In New York City, thousands will gather near Columbus Circle as part of #YouthClimateStrike and #Fridays4Future, a movement spearheaded by Greta Thunberg, a 16-year old Swedish girl. Just yesterday, The Nobel Peace Prize committee announced that she has been nominated for their prestigious honor, joining Malala Yousafzai as one of the youngest individuals ever put forward for the prestigious honor. Here are photos of students, some as young as third grade, taking part in the Strike at a pre-rally today in Washington Square Park. 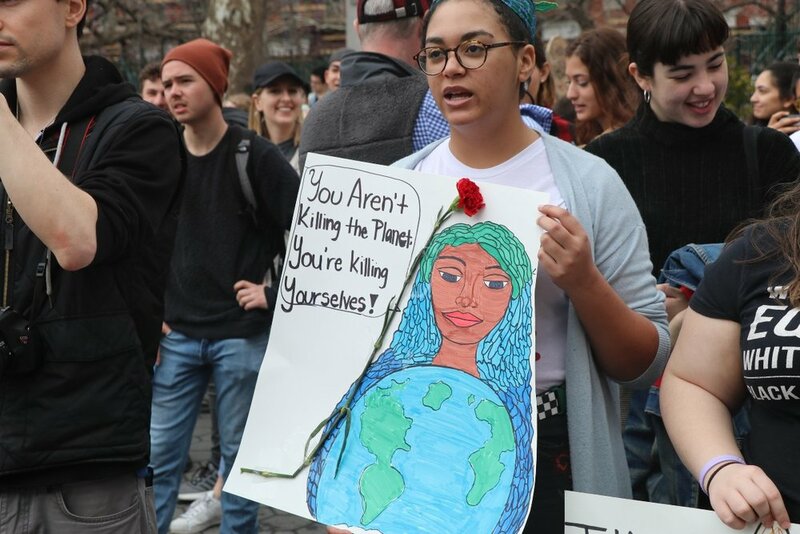 Youth are rising up to fight for their future in a world where the fossil fuel industry magnates, poised to make billions digging up all the dinosaur reserves they can dig up, pipe up, frack up before the global renewable energy wave finally fully takes hold. At today’s rally in New York City, Food and Water Watch, 350.org and Greenpeace called for a stop to the Williams Pipeline, asking citizens to call upon Governor Cuomo to honor his pledge to keep fracking out of New York State. The proposed pipeline, which would dig up New York City Harbor, where whales and seals have recently been sighted due to several decades of active pollution reduction, would bring fracked gas from Pennsylvania into New York. Today is the final day to make comments at the DEC at Stop the Williams Pipeline. Never before has an entire generation of school children and teenagers taken to the streets in the tens of thousands for climate change. They are awake, articulate and are working to voice their concern for their future on Planet Earth. Some are making headlines with solutions and inventions that are incredibly inspiring, moving beyond doom and gloom despair to actively engaging in resiliency. One of these, Boyan Slat, managed to raise $22 million in investments for his invention to clean up the world’s oceans, currently in active prototype with projections to remove 50% of the world’s large form plastic in five years. Now 24 years old, his company is called The Ocean Clean Up. While this project has great promise, individuals can do a lot in their own lives by eschewing single use plastic in all of its forms: cups, lids, plastic straws, plastic bags. A tipping point with plastic straws arrived in the form of a viral video that showed the bloody extraction of a plastic straw from the nose of a sea turtle. The video has garnered over 33 million views, leading to pledges of fast food giants to phase out plastic straws. Trigger warning: the video is upsetting but managed to viralize the message about plastic pollution to such a degree that metal straws are now offered for the hippest cocktails in Williamsburg. What will it take to completely take ourselves off the plastic economy, which is part of the fossil fuel economy? What ways can you support the youth movements underway? What steps are you taking in your own life to eliminate single-use plastic? How do you lower your own carbon footprint?